We are a friendly Spanish tapas bar in the heart of Camden Town, and our sangrias have been copied by many. This makes us happy! If you drink them, you will probably be happy, too. Bar Gansa manages to conjure up some of the elemental magic and spirit of Spain with its patriotic red and yellow colour schemes, well-worn wooden tables, terracotta pots, and vibrant paintings of bullfights and flamenco. Loved it. Delicious food and sangria, and now trying to copy the aubergine dish. So delicious. Lovely restaurant in a good position. Lovely reasonably priced food. Experience was spoiled by initially being turned away as wowcher voucher was not valid at weekends. As this detail was not mentioned either when booking the table or the voucher, they honoured the voucher and could not have been nicer. The food and service were perfect. The staff were very helpful with helping me to select food to fit my vegan diet. Nice cosy little Spanish restaurant. Great food! We had a voucher so it was amazing value (I imagine it would still be relatively good value for the area even without a voucher). It was pretty quiet as it was a Sunday afternoon. Easily accessible from Camden tube ,a fun tapas restaurant offering main plates as well. Reasonable pric es for standard tapas. He plus for me is the re gulag flamenco. Tasty good. Ok service. Music too loud so moved tables. Waited long time on entrance and was ignored but service good after that. Brilliant ambience with quality food (if you love great tasting food This is a great spot). Great service,staff are attentive ,clientele and on the weekend you will find the Spanish guitarists style of play to add to this gem of escapism. I was in Gans Bar a few days ago, I organized an engagement there. Service very nice, helpful and takes care of the client. I 100% recommend this restaurant. It's worth taking a look there. Very nice experience though the reason why I chose Bar Ganza for our party of 9 was the flamenco dance. It was cancelled so the whole idea of our evening was kind of a torso. That was very disappointing, we came all the way from Finland. But maybe next time. Fab food, great service in a lovely little restaurant! Really nice atmosphere, great service and food. Would definitely recommend! Excellent restaurant. Really good food, we had eight different tapas dishes and enjoyed everything. Really nice, friendly service and very nice atmosphere. Fantastic food and a great price, we enjoyed our meal and will be back. Great for happy hour and cocktails, but nice little tapas bar. Would recommend if in the area. we went for our wedding anniversary. We love Flaminco and Spanish food. It was great and would go again. Came here for a preconcert dinner, Jazz Cafe is just around the corner. With 2 glasses of red Pleno. Muscles were served in a creamy sauce with leek. It might've been a good choice for bread lovers to dip into the sauce. Boquerones were as expected. Calamares slightly slim, but ok. Aubergines were served with honey, which didn't go with any of the other tapas dishes we have chosen. I found honey a very strange sauce accompaniment. This was 2for one offer on the tapas. I wish we tried a regular menu. As all the previous menu suggests delicious offerings. Our experience was very disappointing, unfortunately. Service and stuff were very friendly and fast, can't fault it. Delicious food, greatake staff, very good wine, our local place now! Outstanding food, we're both fussy foodies and this place amazed both of us. The meatballs, tomato bread and paella are all delicious! Best paella I've ever eaten by a long way. Can't recommend this place enough. Service is great too. It's a must try! Excellent service, food and ambience. I am Spanish and the flamenco night was superb!!! An excellent tapas which offers early evening an outstanding two for one deal. The dishes are well prepared with fresh ingredients and we both found the items we ordered delicious, particularly the fish. The wine list is extensive and reasonably priced. The service could not be faulted. Highly recommended. Great food, our waitress was wonderful. Very good atmosphere and background music. However we had several spanish people in the group and they were very disappointed to see that certain foods, such as the "Valencian paella" and "pulpo a la gallega" were not actually a Valencian paella or the real pulpo a la gallega. We are not saying it was bad food, but we kindly ask that you change those misleading names. Lovely ambience. Delicious food. Flamenco is spectacular. Bar Gansa has been going for years but this was my first visit but will certainly not be my last. The food was very good; arrived promptly and was served by a friendly staff. On Sunday there is a Happy Hour from 1700 when cocktails are all £5 and you get two tapas for the price of one; so even better value. The desserts are also very nice. This will be my regular tapas bar in the area in the future. Just love it! 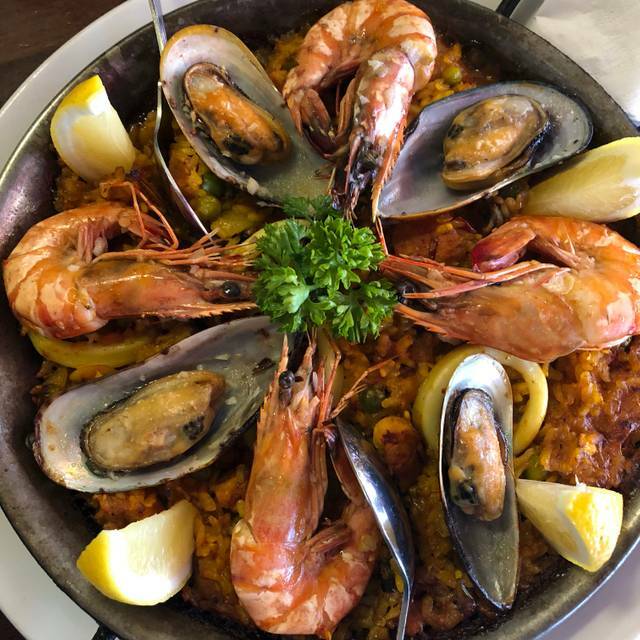 I've been there for a couple of times, really love the tapas and paella!!! Food good, and lots of variety of tapas. Just a bit quiet though! It seems to start to get busier from nine onwards, Spanish-style. Very good food and service at a good price. Very good location for going on to the Jazz café afterwards. Great location v close to Camden Town tube - lovely staff and great glasses of fresh fruit with sangria. Food is ok, but nothing special. We went before a show at the Jazz Cafe and it was the right place: just a couple of quick tapas and a glass of wine to enjoy in a lively bar. I wouldn't say the food is amazing but it was good enough and I'd go back. We came here for a birthday meal and it was pretty empty. We ordered drinks which took about 25 minutes to come! Waiter kept dropping things on my mum including dirty cutlery. They don't do anything for birthdays either no matter how many times you hint.